Great For Cosmetics, Boxes Goods, Candies, etc. 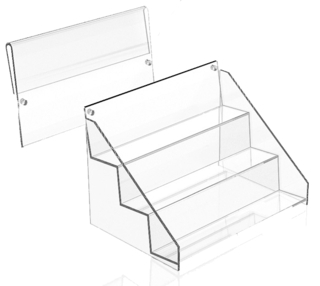 Our Clear Acrylic Tiered Display Shelves are Durable Sturdy Units to Hold and Display Your Cards, Boxed Goods or Other Products and Promotional Items. These High Quality Display Racks Require NO ASSEMBLY (other than the header) and will HELP You Sell Your Products.